Figure AR-2. Main soil zones of southern Saskatchewan. To address the problem of outdated agricultural methods, five experimental farms were established under the Experimental Farm Station Act of June 2, 1886. These were located at: Nappan, Nova Scotia; Brandon, Manitoba; Indian Head, North-West Territories; and Agassiz, British Columbia - with the Central Experimental Farm at Ottawa acting as the headquarters for the Experimental Farms System. Figure AR-1. 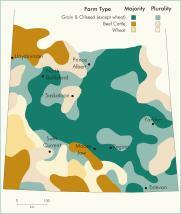 Types of farms in southern Saskatchewan. The Indian Head Experimental Farm opened in 1887, with Angus Mackay as superintendent, responsible for the whole of the North-West Territories. The intent of the farm was to meet the needs of new settlers for reliable information on the best farming methods and practices for local conditions. Long-term studies with field crops, animal husbandry and horticulture were initiated. Figure AR-3. 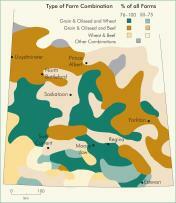 Farm combinations in southern Saskatchewan. Because the experimental farm at Indian Head could not supply all the necessary information to immigrant farmers entering Saskatchewan, a second experimental station was established at Rosthern in 1908 to aid farmers in central Saskatchewan. A station at Scott was opened in 1911 to develop practices suited to the dry plains of the west-central region. 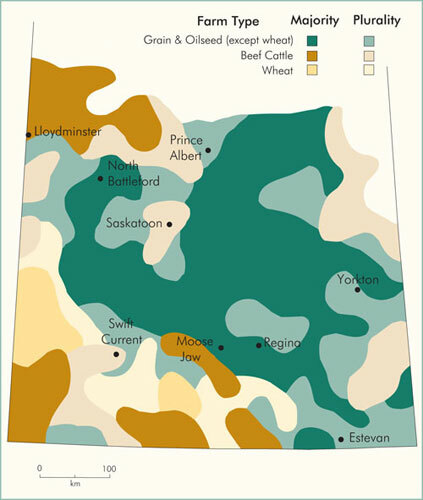 In 1920, an experimental station was established at Swift Current to improve agricultural methods for the dry areas of southern Saskatchewan and Alberta. The Regina Experimental Substation, which became an experimental station in 1954, was opened in 1931, to work on the problems of soil drifting and weed control. In 1934 an experimental station at Melfort was started to serve the Farming community of east-central Saskatchewan, an area suited to livestock production. The Experimental Farms System was also briefly responsible for the administration of the Dominion Forest Nursery Stations at Indian Head and Sutherland. In 1935, the Prairie Farm Rehabilitation Administration (PFRA) was established to provide for the rehabilitation of the drought-stricken areas of Manitoba, Saskatchewan and Alberta. From 1935 to 1946 the Indian Head Experimental Farm administered the PFRA program and was responsible for reclamation projects. In 1936, the PFRA financed at the Swift Current Experimental Station the Soil Research Laboratory that was to carry out studies into soil fertility, moisture Conservation, and wind erosion control. The laboratory became a section of the Swift Current Station in 1957. Amalgamation of several federal laboratories in Saskatoon resulted in the formation of the Saskatoon Research Station in 1959. The new station was entrusted to conduct research on the breeding and Agronomy of oilseed, forage and cereal crops, as well as the control of Plant Diseases and insect pests. Changes within Agriculture Canada resulted in the closure of the stations at Scott in 1940, and at Regina in 1997. With the reorganization of the Experimental Farms System as the Research Branch in 1959, the experimental stations became research stations. In 1995, Agriculture Canada was further restructured as Agriculture and Agri-Food Canada (AAFC), with the research stations being reorganized to encourage a more interdisciplinary approach to farming and the food industry. Currently, there are two major research centres in Saskatchewan operated by the Research Branch of AAFC. The Saskatoon Research Centre and its two associated research farms at Scott and Melfort have as their mandate a long-term commitment in crop research to the agri-food industry in western Canada. This includes programs to improve germplasm of oilseed and Forage Crops, crop production and pest control practices for the parkland region, and to develop processes and products that expand the utilization of prairie crops. At Swift Current, the Semiarid Prairie Agricultural Research Centre (SPARC), together with the associated Indian Head Research Farm and the Land Resources Unit in Saskatoon, carry out research on the semiarid Soils of southwestern Saskatchewan and southeastern Alberta to develop agricultural practices that will support cereal, forage and field crops while conserving moisture and soil fertility. Initially, the research stations were an essential element of rural communities, providing practical information to improve the effectiveness of local agriculture. 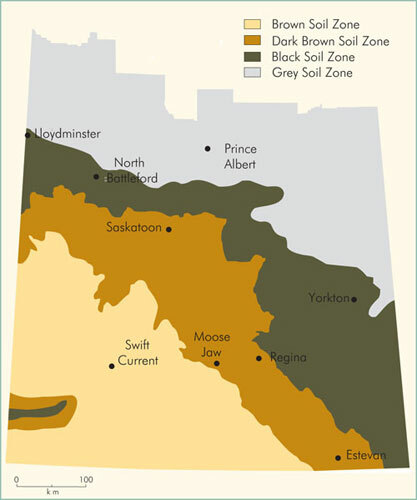 During the 1930s, a concerted effort against the blowing topsoil by the Indian Head Experimental Farm and the stations at Regina, Rosthern, Scott and Swift Current was effective in developing tillage methods that reduced soil erosion. The post-war years saw great changes with the introduction of selective chemicals to control insects, plant diseases and Weeds. Programs were set up at all stations to advise farmers on the use of these new chemicals. Nutrition and management studies at Indian Head, Melfort and Scott have done much to improve livestock production in the province. Great efforts have been made to breed crops with increased yields which are early maturing and resistant to diseases, insect pests and Drought. The stations at Saskatoon and Swift Current have been particularly successful in this regard, with the canola breeding program at the former resulting in the oilseed becoming a major Canadian crop, second only to wheat production. Anon. 1939. Fifty Years of Progress on Dominion Experimental Farms 1886-1936. Ottawa: Patenaude; Anstey, T.H. 1986. One Hundred Harvests: Research Branch, Agriculture Canada, 1886-1986. Agriculture Canada Historical Series, No. 27.